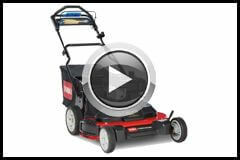 The solid and robust Toro TurfMaster is the ideal lawn mower for heavy duty commercial used. The 30" cutting deck is very generous cutting mowing time by up to 40% ensuring you can fit more jobs in a single day. The self-propelled engineering enables you to mow lawns more easily, as there is no need to push the mower. Accompanied by the large fuel tank, blade stop system and the heavy duty build Toro have designed a commercial grade machine to match all conditions. The steel bullnose front bumper, prevents the engine from being damaged protecting it from unwanted contact. 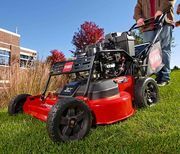 The Toro TurfMaster is equipped with deck skid plates, tough sealed transmission and a strong one-piece handle all designed for the physical working conditions of a commercial environment. The Wheels are made of strong co-polymer with ball bearings for a longer life span and smoother, easier operation for the operator. The Toro TurfMaster has a mulching system fitted and ready to be used at the operators discretion. Removing the hassle of having to deal with removing clippings from the bag. This large fuel tank on the Toro TurfMaster ensures you get mower mowing in-between refuelling. This system results in excellent control and is easy to operate.